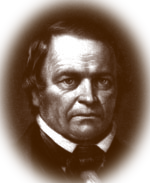 William Miller | My Gospel Workers | "Redeeming the Time"
Miller was a farmer, justice of the peace, sheriff, and Baptist preacher, who, from 1831 to 1844, preached the immanent return of Christ. He was born in Pittsfield, Massachusetts. His mother was a deeply religious person, and his father a soldier. Probably as a result, there was tension in his early life between patriotism and religious belief. He was largely self-educated, attending school only for three months each winter between ages 9 and 14. Miller began preaching in small towns at first, and then, with the help of Joshua Himes, moved to the larger cities, bringing his second advent message to many thousands. Hundreds of ministers and laymen joined in preaching the message. By the expected time for Christ’s return, Miller had between 50,000 to 100,000 followers, commonly known as Millerites. He did not set a specific date for the second advent. At first he said only that it would be “about 1843.” He finally set an ultimate time in the spring of 1844. Others picked the more precise date of October 22, 1844, which Miller and many of the leaders of the first movement accepted shortly before the date arrived. Many clergymen joined Miller in his preaching. At the same time, he was greatly opposed by others. So much so, that in the final months, most churches were closed to the second advent preaching, and many of those who accepted the message were put out of their churches. Ellen White has written positively about Miller in The Great Controversy and elsewhere. She heard him preach, and accepted his teachings, going through the disappointment at age 16. She believed that his preaching fulfilled the prophecies of Scripture, and saw him being guided by the Lord. Miller never accepted advancing understanding of the disappointment. Ellen White wrote: “I saw that William Miller erred as he was soon to enter the heavenly Canaan, in suffering his influence to go against the truth. Others led him to this; others must account for it. But angels watch the precious dust of this servant of God, and he will come forth at the sound of the last trump.”–Early Writings, p. 258. After the disappointment of October 22, he wrote: “Although I have been twice disappointed, I am not yet cast down or discouraged. . . . I have fixed my mind upon another time, and here I mean to stand until God gives me more light,–and that is Today, TODAY, and TODAY, until He comes, and I see Him for whom my soul yearns.”–The Midnight Cry, Dec. 5, 1844, pp. 179, 180.